This chapter is a long one, you could see it as an apart entity. We claim that our moon is in fact a displaced planet. A planet that is 'placed' there to help us -humans- survive in one way or another. No doubt in our mind that our moon will be inhabitat by humans. Maybe that is already a fact, but if not, it will not take that long before it will be the case. Question is if we, ordinary citizens, will know the details. Our view about our moon must be a crazy one to many, but after all that view is not important to support our main opinion: extra terrestrial beings visited Earth in the past. Note that if so many believe that Jesus ascended to heaven you don't have to be ashamed if you too -just like we do- believe our moon could be a displaced planet. Don’t believe too fast that something is impossible. And above all: Think for yourself. Let us assume that humans will be able to transfer their consciousness (our soul) into another living being within 500 years (some scientists claim that without ethical rules this would have been possible already). What would we do if we, 500 years from now, suddenly discovered life on another planet, life that is far behind us on an evolutionary level? A plausible answer: we would transplant our consciousness into a living being of that planet and dominate all other life on that planet. Until the late seventies the 'fission theory' was commonly accepted as an explanation for the origin of the moon: ‘When Earth was still a spinning sphere of lava, a part broke loose and became our moon. ' The theory was full of flaws, so there came another explanation: ‘The moon was once a planet that due to natural circumstances came too close and was captured by the gravity of Earth.' A theory that showed as many flaws as the first one. Unlike other moons in our solar system, where there is sometimes more than one acceptable explanation for their existence, every theory about the origin of our moon seems fundamentally impossible. The main reason? Earth is simply too small to 'capture' or 'reject and hold' such a large moon in an almost circular orbit. A summary of other theories. In 1976 the impact theory emerged. It took a long time, but now this theory is seen as the official explanation. According to the impact theory the moon arose from a collision of an immense celestial body (called Theia) with Earth. NASA seems to ignore all obstacles of the impact theory. However the obstacles are huge. One of the stumbling blocks? The ratios of oxygen isotopes of Earth- and moonstones are identical, while it’s clear now that an impact would have mixed everything in a disproportionate manner. So the oxygen ratios are only one of the obstacles, but it’s one that NASA could counter. So they focus on it. You can also skip the clip. (We regret that you will have no other choice because we discovered on 23 December 2013 that the fragment has disappeared from YouTube.) You can believe us: Summarized in a few words it said that besides the oxygen isotopes there are much more ratios identical. 2014-01-08: Youtube if you were not an eye opener to us sometimes, we would not love you so much! Because fragments seem to come and go. We save ourselves the trouble to change our text again. You readers, for sure, will understand. We see nothing funny about this. And from time to time they (order to) launch new theories about our moon. To make a long story short: the discussions about the origin of the moon are endless. And the real rulers like to keep it that way. We know extremely little about our moon. 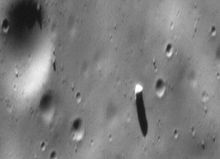 If we are to believe official sources, one has only scratched the moon surface (so to speak). That we think there are traces of extraterrestrial visit on the moon, should be clear after reading this website. But there's a lot more: and we have the impression that scientists are not allowed to do everything to solve the mysteries. -Why the moon's orbit deviates so much from the equatorial plane of Earth? -Why does Venus has no moon? -If the moon for hundreds of millions of years slowed down earth's rotation, why Earth still rotates around its axis so fast? Note that there seem to be a lot of structures on the moon. Plenty of photos are suggesting that. Also scientists must be baffled by so many strange photos, so they will keep on searching for explanations. One scientist may have found a solution for a so-called tower. (Please make your own conclusion.) With 'Google Moon' 'they' let us believe that now everyone can explore the whole moon surface. Strange that the so-called towers we found all seem to have the same smooth unnatural appearance. As if the pictures were manipulated. If this is the case it would be no surprise to us because all pictures from the moon are coming from NASA. In the 19th century astronomers and geologists believed that practically all meteorites ever reached planet Earth came from the moon. Volcanoes on the moon were responsible. At least, that was what scholars thought. Later it became clear the moon has no active volcanoes for a billion of years. Nevertheless it was sure that moon rocks on Earth, especially in desert areas, must have been numerous. Hundreds of millions of years of meteors and comets hitting the lunar surface, had scattered space with stones. And the Earth’s gravity, combined with the short distance moon/Earth, had ensured a steady rain of meteorites on Earth. At least, that was what scholars of a slightly younger generation thought. NASA knows very well the difference between real and fake moon rocks. So let us assume that about the number of moonstones on Earth they are sincere. At the end of 2010 there were 134 moon rocks (about 50 kilograms). Why have hundreds of millions of years of impacts on the moon yielded such a small number of moon rocks on Earth? A summary of lunar anomalies (Note: a reference does not necessarily mean that we agree with everything.) Greek and Roman authors speak about people that lived before there was a moon in the sky. An Earth without the moon? Furthermore, in Tiahuanaco (Tiwanaku, Bolivia) they found characters telling us about the arrival of the moon (approximately 12.600 years ago). Problem is that nobody seems to claim the translation of the characters. Does life on Earth really needs the moon? In each presentation we hear that the moon is essential for life on Earth. Therefore she always must have been there. Here too, however, we must speak of an enigma. Because, why are there so many blind followers of that idea? After some research, it’s clear that the simple models are not quite that simple. Special astronomers dare (somewhat) row against the tide. The conclusion we make from various 'guesses': The value of the moon for life on Earth is grossly overrated. The moon is so close and yet she is one big mystery. So big that some began to think 'outside the box '. Nobody can explain how it is possible that the location of the moon can be where it is now. That should be clear. Nobody knows how she is formed. To us that's a fact too. She even could have been formed after an impact with Mars. Unlike Earth, Mars has an obvious gigantic magma ocean, something that points to a giant impact. And the iron oxide content of the moon's regolith resembles that of Mars' regolith. All in all it seems that our moon looks more to be coming from Mars than from Earth. But to be clear: in this context that doesn't matter. Can our moon ever have been replaced? Should our geniuses today be able to replace the moon? Who knows for sure? She has remarkably little mass. Something that made us think she may have been deliberately hollowed out. It could explain the vibrations after some Apollo landings. As if the moon was ringing like a bell. Besides, there may have been more than one reason why our visitors could have hollowed out the moon, but we won't get into that. Moreover, Tower and Shard could hide a technology that, utilizing the many mascons, can influence gravity. (Or does the Tower has a destination that pushes even more the imagination and is he -as many believe- a kind of signpost for the soul?) Anyway: at the current pace of technological growth, in about two hundred years -a negligible period- we can’t exclude anything. Not even the signpost destination. Anyway there are lots of studies about how to move a planet. We suspect Tesla knew about secret knowledge so his idea could have come -like so many other ideas- from our creators. By the way, the grooves on Phobos, for one reason or another, could point to a 'towing project'. If a displacement of a small planet by extraterrestrials once took place, it could solve all mysteries about our moon. Why the near side of the moon consists of about 31 percent of ‘seas’ while the far side merely consists of one percent seas? Besides, the last one has much more craters. That Earth is protecting the near site against comet impacts is not a valid explanation. Researchers now think that the 'heat-producing elements' of the near side have created the seas, or that the 'two-moons-theory' can help explain. At the same time they admit they are facing an enigma. If our moon once was our natural neighbor between Earth and Mars, it would explain everything. Mercury and Venus rotate but very slow around their axis. In an orbit between Earth and Mars our lighter moon would possibly always have faced the sun with the same side. Result: many craters on the far side and a fairly intact, solidified looking, near side. Just a remark: Venus’ temperature is about 500 degrees Celsius. Comets make more shallow craters on Venus because the melting surroundings have time to fill the crater more or less. The same thing could have happened on the moon. Venus has a thick atmosphere that slows down a lot of comets and asteroids, but the heat itself of Venus plays also a big role in the shallowness of the craters. By the way, if once our moon was a separate planet with one side directed to the sun, the temperature could have been much higher than 500 degrees, for sure in the early days of the planet. So the scorched side would not be a surprise. Added to that: the sun would have probably intercepted a lot of comets and asteroids. Doing so she protected one side of the moon much more than the other site of getting hit by comets or asteroids. One of many sites that clearly demonstrate the relationship between hot temperatures and shallowness of craters. Mercury was the 'winged messenger of the gods' in Greek mythology. As you will remark further, that name fits better with our moon. And although the name was given by the Romans, supposedly because of the speed at which the planet revolves around the sun, we know that already before Plato there were people with secret knowledge. Meanwhile, we know that the real rulers always have liked to play (name) games. But they are prudent for millennia. We also remain prudent. But the striking resemblance made us think that maybe they once thought to name our moon 'Mercury'. Only they concluded: ‘Better not’. 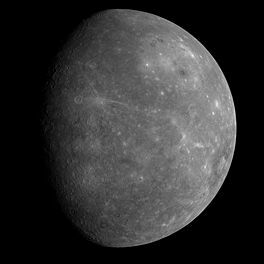 Was Mercury once the moon of Venus? We think so. Just like our moon originally was the moon of Earth (or Mars) but with a very eccentric orbit, later escaped (just like Venus' moon) and just recently was brought to planet Earth by our creators. Only, she has been put in a very special place, a place she never could have reached without help from above. By the way, great scholars took for granted that a planet inhabited by aliens could come from everywhere -even from outside our solar system-. In 2013 Scholz's star system was discovered and we have to admit we didn't even had a clue something like this was possible. But in the mean time it has been proven that there are wandering star systems. Systems which cross space without playing by the rules and which -by doing so- are passing very close to other systems (like ours). One of those systems has brought our consciousness to planet Earth. All in all we now think that those scholars were very close to the truth. Although they may not dare to share our vision. After all, in 2009 they were only just fantasizing. Responses to the article were welcome. We didn’t mention our opinion about how logic it is that aliens never would land (to stay) on Earth because of so many problems (gravity, atmosphere, viruses, etcetera ). During the time she followed her own orbit, she could have been the laboratory of our creators, the place where they transplanted their soul in an earthly female body to make it possible for them to survive on Earth. So, all in all we tempered ourselves. What turned out? Our reaction was banned, while comments like 'I send my mother-in-law to go and see’ were published by many. Tried three times to get our reaction published, without result, and without explanation from the moderator. Apparently moderators of internet newspapers see us as idiots (we hope we are normal citizens). In short, we don’t like moderators anymore, but they have led us to the point that our unpublished response has grown to the size of an internet book. Or how a small incident can be a reason to start writing. Albeit we try to stay modest because we experienced that writing is a job too hard for us. About Dimitris Christodoulou, his publication list and curriculum vitae. December 2011: a You Tube clip hits the news: 'a spaceship as big as our moon is hiding behind mercury.‘ Three million viewers in a few days. Finally one will see the fault in the NASA photo. Yet discussions reveal that scientists think that spaceships as big as our moon could exist. And that people all over the world are very interested in the alien issue. This could be an extra indication that the moon is also more popular than they let us believe. Big question: Where is the moon in ancient paintings? Before the mega disasters (until thousands of years later) the moon was never depicted. A fascinating and mysterious celestial body that changes shape and is childishly simple to be painted, is nowhere to be seen in any picture older than say 8000 years. Why the first cave painters apparently ruminated about animals is indeed a mystery. But they made countless drawings not limited to animals, in places far outside Europe. Only, they never painted the moon. Strange they painted stars and star clusters. Stars were dots in their paintings (that is logical). The Sun was a (concentric) circle. Also fairly logical. But where is the crescent moon? Thanks to the moon humans could hunt at night, they could travel or flee ... The moon must have been a 'God Gift' to them. But still they didn't picture her. Come on. Our ancestors had a keen interest in the night sky. And they thought symbolic. The chances are large –húge- that they had painted the moon as a half moon ... if that half moon would have been there. Some claim that so-called lunar calendars have been recovered, which show the lunar cycle. But if one observed the moon that closely, then it becomes completely incomprehensible why no one ever painted a crescent moon. Archaeologists are desperately looking for the moon in prehistoric art. So desperate that they assume that the moon must have been a bull, while certain constellations then again were other animals. But if the prehistoric genius has invented a variant of the zodiac, why didn’t that genius painted a crescent moon? Not once, but tens of thousands of times? 5000 years after the mega catastrophes suddenly the moon is there. And in roughly 5000 more years she’s a worldwide symbol. But for more than 20,000 years before the mega disasters, an endless time frame -so to speak- a time where painters painted animals like animals, stars as stars, the sun as the sun, a time they made countless depictions of people (women), they never painted the moon as the moon. We must ask ourselves -despite the taboo- how is that possible? We know we keep on going. But that’s because we are astonished. Therefore the characters of the following question should be actually sky-high. The deluge, the disappearance of Atlantis, Göbekli Tepe, the Clovis culture ... Does the moon lies at the base of the mega disasters? Did our creators realized that their original good soul was degenerated? That on planet Earth everything is infected with ‘evil’ because evil is an evolutionary necessity for all living beings on planet Earth ... and in fact is nothing more than egocentrism. Was the destruction of themselves and their creatures part of a sophisticated plan? We’re not going to explain our moral thoughts on good and evil. And we hope you will excuse us for repeating ourselves in our site: We love animals but they have no soul. They have only the germs of a soul that on planet Earth never could have developed. Animals are not evil -in the moral sense- because they don’t know the difference between good and evil. Humans do, because humans are partly animal and partly higher being (although the proportions vary from person to person). That higher being is like a built in quantum computer in our DNA that replicates itself with humans. Did they put the moon in orbit around Earth and did they wiped out a mistake to give a chance to a 'new' human being? Did the gods destroyed themselves and sinful humanity -their mutant creatures- because they saw that all went wrong? Did they experimented too much with life on Earth? Besides: Spoken about non-believers, we respect their meaning, but some of them have really hurt us on some internet forums. We have a pretty good skin -maybe a bit out of fashion- but we have our limits. So we hope some of our opponents are for some reason or another not capable to respect the meaning of others. No offence, but we had to say it. Did they realized the offspring of a mutant (depicted as the Venus figurines) born in the south of France had spread to much? Did they selected people to survive somewhat everywhere on earth? Were there Noahs in multiple places? Were there gods in multiple places? To us the answer each time is yes. Plato seemed to be convinced, Bulwer-Lytton gives a lead, and the oldest myths leave little doubt. They may be myths but those of the most ancient cultures show remarkable resemblances. Because of that we conclude that the gods have selected some people to survive the Flood in several places on earth. The gods also seem to have had different shapes and forms depending on their location, but so it goes if you experiment a little bit too much. Fact is there is a giant gap between the mega catastrophes and the first civilizations (like Sumerians). Is that gap caused by the crossbreeding between selected survivors and others (which were not selected but survived against all odds)? HUMANS DON'T FIT ON EARTH. A lot of people must realize this. Human consciousness -the human soul- is far too evolved. We accept that 'consciousness' and 'soul' are not exactly the same. Animals too have a sort of consciousness. They are aware of certain things. You can discuss about it but we see the human soul as incomparable. To say the least. Where else can human consciousness come from if it was not implanted in a human creature by the gods? Only ... something went wrong ... not only we (crossbred species) make mistakes ... the gods made them too .... they underestimated the conditions of life on Earth. At some point they must have realised a tabula rasa was the best solution. So a new species in time would evolve and find the vital information the gods left behind. The new species would discover that the moon is not the natural satellite of Earth, but rather the ultimate centre of knowledge, the ultimate spaceship, caravan, lifeboat ... the best vault ever made ... all intended to guard them. The gods left us messages on earth but the moon was their superior locker. Nothing would destroy their message and humans who would reach the moon would be clever enough to understand. The very small number of real rulers know the message. Therefore we think they are much more humble than most of us will accept. But what can they do? Telling the truth would mean chaos. There has to be a group of leaders with superior (extra terrestrial) knowledge and power. If not, our world would soon be overwhelmed by evil. Those who think that it can't get worse than it is today, have to think again. Those who think the world is too bad to bring a -good- child into are wrong. Slowly but surely the world becomes a better place. The impression some have that now it is worse than ever is because we are aware of what takes place through the media. Intolerance and cruelties are still abundant. But in the past it was far worse. After death immortal souls unite. They become part of an unimaginable plasma life form (UFO). (But that’s an item of another chapter). Some know the fundamental truth, but they hide her behind a provocative symbolism. Read the book 'The Secret Architecture of Our Nation's Capital', ponder the Georgia guidestones, see the mysterious bound with Bulwer-Lytton and his Vril-ya (who curiously lived just like the guidestones orders). Why did the moonlandings stopped? Novus ordo seclorum (the other side of the seal) ... the freemasons ... (Bulwer-Lytton, the author of 'The Coming Race' and an icon of the nazi's and their extra ordinary knowledge, was a Rosicrucian. R.C. Cristian, initiator of the guidestones, apparently Christian Rosenkreutz, was the founder of the Rosicrucian order, George Washington ... just until, of all people, Buzz Aldrin ...). The signals one day will be so abundant that even the greatest sceptics will accept the truth. But at the moment 'they' are still hiding the so-called smoking gun. 'Tell the truth sideways because she can be devastating.’ However, there are truths which one better denies. Nonchalantly, to allow some doubt anyway, so the shock that must come sooner or later, will be less devastating. So this subtitle is a little bit misleading because the gods that -we think- came from Scholz's system were genderless. Although we believe that our alien visitors had no problem to genetic engineer a male, we believe they preferred women. Maybe because women looked a little bit more like them. Less aggressive, less power-minded, less sexual behavior, more careful, more caring ... and maybe to some extent easier to genetically manipulate. Men, please don’t panic but it’s written in the stars. Future will make us superfluous, because the Y chromosome is disappearing. Did Isis -Isis as a collective name for all mother/moon goddesses- sacrificed herself for 'sinful mankind' hoping that consciousness would survive and grow (arise), but then again in a form which this time did match conditions on planet Earth? Did 'Isis' hoped the new human would not make the same mistakes because of the knowledge the gods left behind? By means of the mega catastrophes nature (partially) has been taken over control of the gods. Men came out of the shadows some 6000 years ago, about the time of Genesis. Above we used the word partially because women still have more compassion and are less egocentric than men. This compassion or even altruism has nothing to do with mother Earth but has everything to do with mother goddesses'. Time to realize that women in general still possess -a (little) bit more than men- a trait (compassion) that doesn't come from planet Earth. 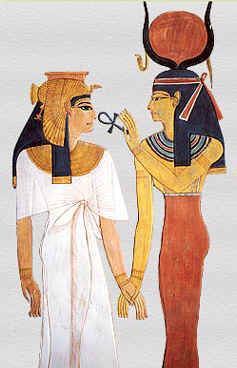 1250 BC: Isis gives the ankh cross -symbol for resurrection of consciousness- to Nefertari (photo: Wikipedia). Years ago we wouldn't have believed a word from this interview. More, we even never read it because we thought it was obvious a sort of lunatic who wrote it. Now we think the article could be true. And even if it is a hoax, it could be a manner accepted by the real rulers (and their media) to make the unthinkable thinkable. Numerous things about our moon are screaming to be solved. That is not a coincidence! Sure that the real rulers know the truth, but they don't want us to know it ... yet. For every anomaly our real leaders have an explanation. Not so difficult to fabricate one if you have all the information. And if their explanation falls short, there is always the trick to sow doubts on a problematic item. By the way, if beings like us with comparable material once landed on the moon one can easily confuse us about the origin of some mystery object (because one can say 'It is a left over from our previous missions'). But to us -after a lot of research- some objects or structures on the moon are from an ancient civilization ... from the gods. There are many anomalies but as an example we show you just 10 of them. Did the gods knew that humans 'one day' will have to look for another home planet? Earth is plan A for humanity (with many thanks to the technology of the gods that must curb the dangers Earth is facing). But you never know. One thing is for sure: if humans have to decide to live on another planet (Mars, Planet X or Y or whatever you want to call that planet), then the moon has to play a major role. If not as a spaceship, caravan or lifeboat, then surely as a launch platform. High technological power placed on the guardian of planet Earth can protect us. A moon base was a no brainer in the sixties. And it still is. Only … for more than 40 years no human being landed on the moon. This is simply unbelievable. If you read interviews with Elon Musk, Richard Branson, Jeff Bezos … you cannot get rid of the idea that these men must think the same. Forty years is an incredibly long timespan to do … how will we clarify ourselves … nothing. Humans always want to explore, beat a competitor … Forty years? Did ‘they’ needed time to clean up the moon? Now people like Jeff Bezos (Amazon) want to build a colony on the moon. He will start with his private money and hopes others will kick in … We hope our real leaders give him the green light. If not, he will face hard times. Just like Elon Musk is facing at the moment, at least this is the impression we have. He too has special plans, with … Mars. But if he will go to Mars, we don’t see any plausible reason why he would pass the moon. We think chances are great the moon still is ‘Top Secret territory’, even after so many years. Jeff Bezos details his moon colony ambitions. Feff Bezos and Elon Musk about their projects. The vision is clear: private companies want to go to the moon. Some leaders of those companies have enough money to go to the moon ON THEIR OWN (so to speak). So why so many of us keep on saying that (for a superpower nation) it is too expensive to go to the moon?? Why so many of us keep saying that traveling to the moon is a waste of money if those brilliant men are saying the contrary? Be sure that a lot of problems will arise. Beginning with the fact that the Space Treaty from 1967 seems to put forward that every activity on the moon must be supported by the state. Did the gods had superior spacecraft or did they used wormholes? They had superior rockets but not thát superior, compared to the hidden technology of our geniuses. Our geniuses who will build further and always will try to do better than their opponent. A feature of humankind based on earth's life conditions: 'Be better than your opponent'. A pressure of competition our alien ancestors had lost during the uncountable years of their evolution. But who knows how far they are evolved in the mean time? WE are the aliens on Earth. So much things point to this conclusion. We are their creatures ... and they keep an eye on us with their bundled consciousness (UFO's). Remember what our sixth man on the moon once said: "Aliens are watching us. They prevented for example a nuclear war in the past." And believe us: not only Mitchel -we speak about high ranking believable people- said those things. Study Charles Hapgood. In the 1960s Hapgood thought that approximately 12.000 years ago the icecaps suddenly shifted. He was a respected researcher who frequented the highest reunions of scholars, but was (we believe wrongly) ultimately ranked as a pseudoscientist (a magic word). The scientific elite keeps looking for an explanation for the abnormal end of the ice age. Now they say it was caused by a disturbance of earth’s magnetic field. ‘Massive solar flares could penetrate through the atmosphere.’ A phenomenon that -weird or not- may have been caused by the sudden appearance of our moon. The reason for the sudden end of the ice age seems to be an enormous conundrum. Meanwhile scientists (those not belonging to the real rulers) are desperate to find an explanation. But we would not be surprised if some of them are looking at the moon (knowing that silence is golden). We believe that the replacement of the moon went along with the end of the ice age. And frankly said, those who can move a planet, will have little trouble to manipulate the earth's axis. But did they changed the axis? Who knows? Even a small rotation shock caused by the moon could have had devastating consequences. It would have nailed the ancients. And one must agree that according to Plato the stars changed place. Further myths tell us that one side of the world the sun stood still, while on the other side the night didn’t pass. His theory came to him in a dream. Little chance that serious scientists would give him any credit. Why great scholars gave any credit to Hörbiger? Officially it is considered that they would counter Einsteins' work. Einstein was a Jew, and everyone knows how Nazis thought about Jews. However, there are sufficient elements that prove that they knew that Hörbigers' theory was flawed. But that the moon had fallen from the sky 12.600 years ago, thát they were sure off. Why their conviction seemed to grow with the number of expeditions they made? Not because of Einstein and the Jews. And why didn’t they blame landslides, volcanic eruptions or comets for the Great Flood? Or did their expeditions made them wiser? And did they misinterpreted their discoveries somewhat? Did they thought it was a clash, and not an voluntarily executed manoeuvre, possibly a controlled graze? -On top of that: the tidally locked situation gives our leaders a golden opportunity to hide themselves from us. Not visible, no radio signals ... In other words: A perfect place to fulfil top secret work on the far site of the moon. We think there are, and have been, secret missions to the moon, among other secret things paid with the trillions of dollars that are missing in the budget of the USA. We think there is ongoing co-operation between the superpowers concerning the moon, despite all denials. It are decisions made at the highest level. At the level of our real leaders. For example: We don't believe in the so-called Wolf Amendment that prohibits co-operation between the USA and China without permission of the congress. Super powers like China and Russia are simply unstoppable because they won't lose their face. Because now about everyone has to realize that even a manned moon landing since many years can't have been a real obstacle for them. So there must be co-operation behind the scenes ... at the highest level. If not, top secrets could easily come out on a very inappropriate moment. John Logsdon, founder of the Space Policy Institute at George Washington University made it clear to us in an interview where he was talking about the rivalry between superpowers concerning space exploration. The heart of the matter came down to this: ‘they’ can build walls around ‘their’ cooperation. (A slip of the tongue?) Yes there will be rovers on the moon we will be permitted to know about, yes some day there will be a manned moon base (we will be permitted to know about). Why? Because 'THEY' can't curb the world, especially the scientific world, forever. Question is: Will 'THEY' disclose the moon secrets to us? We think they will have to ... But when? A base on the far side of the moon would be an excellent place to launch rockets to alter the course of a dangerous asteroid, the moon would hide every signal. And doing so avoid deadly panic on Earth. Further, our creators knew that sooner or later mankind would search for the roots of the universe. And the best place to do that would be the far side of the moon. Last but not least: could it be that the far side of the moon is the best place to receive signals coming from our creator's planet? Or to make contact with what we think is the ultimate lifeform: Magnetic clusters of consciousness? Irwin came in contact with the controversial American amateur archaeologist Ron Wyatt. With metal detectors they explored the place where according to the Bible the Ark stranded. Wyatt made a number of convincing discoveries ... which were debunked afterwards. However, he keeps insisting that he has found the Ark indeed. Bizarre that Irwin became involved with such research. He was a committed Christian, but also a real scientist and a realist. Did he realized that the Ark once existed? If Irwin knew the secrets of the moon, he'll probably realized that the stories about the flood and the Ark contain more than one ground of truth. A hollowed out asteroid as a space station? Many believe that phobos -just like our own moon- is placed there by extraterrestrials. Some think it was a space station. 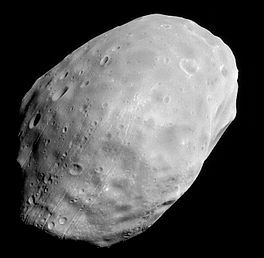 And it must been said, the ‘monolith’ on phobos seems to be constructed by ‘the hands of the gods’. It’s a monolith of which there are no detailed pictures -strange-. 'Phobos is a hollowed out asteroid and a space station.’ That sounds familiar. For believe it or not, Americans are keen to find out how to make a space station from a hollowed out asteroid. The Black Night is a so called satellite that follows a polar orbit. His existence is being disputed for a long time by the authorities (and others). However, we think the Black Night can be one of more satellites that belonged to our creators. The Black Night on Wikipedia. The Black Night on Youtube. - first of all the name of the satellite: as if he was doomed to end in a commercial spot of the Pepsi company. So he could be made ridiculous. Just don’t let mislead you. - why authorities who have all the means to prove the nature of the black knight are not giving us a credible explanation? We think Nikola Tesla knew something that we are not allowed to know. He talked about electromagnetic signals that probably came from the moon and that influenced the human mind (by the way: he didn't exclude a satellite like the Black Night). - in the 50’s several sources mention the satellite (see link to the first page of the site below). A link to one of the best conspiracy websites in the world . We won’t keep on arguing because we can’t prove anything. Of course not. Because it's about a believe in the big picture and the acceptance of the idea that all the indications about our extra terrestrial origins are called into question by a sophisticated machinery. And please don’t tell us that this is not possible.